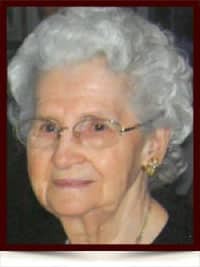 Rose Mary Bramhoff - Edmonton's Burial & Cremation Professionals | Trinity Funeral Home Ltd.
On Thursday, July 20, 2017, Mrs. Rose Mary Bramhoff of Edmonton, passed away at the age of 96. Mrs. Bramhoff is survived by her 2 daughters Ericka French and Jean (Jack) Gamble, son Fred (Fiona) Bramhoff and numerous nieces, nephews and grandchildren. Rose was predeceased by her husband of 55 years, Louis Bramhoff, 2 sons; Carl Bramhoff and George Bramhoff, daughter Susan Bramhoff, 4 sisters; Helen, Ann, Kate and Dora and 3 brothers; Metro, Bill and George. In lieu of flowers, donations can be made to a charity of one’s choice, in Rose’s name.